Grounded and polarized power outlets have sliding safety covers to block unwanted access and dust. Spacious rectangular layout provides easy cable management with different sizes and orientations of power cables. Widely spaced outlets at the four corners accommodate large power adapters, chargers for tools, or wall warts. Tamper-proof USB charging ports with a shared 2.1 amps will fast charge a tablet or two smartphones simultaneously. Protect your valuable electronic devices from power spikes while charging. 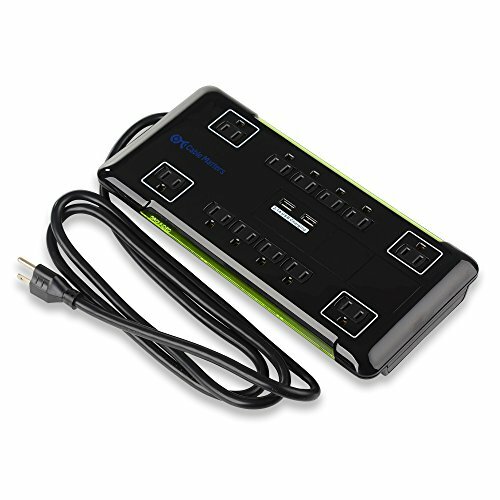 The 4320 joules surge protection rating is 4x more than the average surge protector strip. Advanced X3 MOV (Metal Oxide Varistor technology) in a fire-retardant ceramic casing uses high energy dissipation to absorb excess voltage. Safety shut-down technology uses built-in thermal fuses to power-off the connected equipment when any extended over-voltage is detected or at surge protection end-of-life.